30 cm 62 p. : chiefly col. ill. Reprint. This translation originally published: London: Methuen Children's, 1962. Perfect for lovers of graphic novels, mysteries and historical adventures. The world's most famous travelling reporter is faced with an ancient Inca curse, which is causing its victims to fall into a life-threatening coma. The tomb of Rascar Capac has been unearthed!But one by one, the finders fall into a terrifying coma. Can this be the curse of the Inca gods? 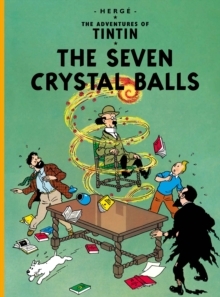 Tintin must somehow fathom out the meaning behind his only clue: the shattered crystal ball lying beside each of the victims . . . The Adventures of Tintin are among the best books for readers aged 8 and up. Herge (Georges Remi) was born in Brussels in 1907.